WATERLOO – Wilfrid Laurier University faculty member Stephanie DeWitte-Orr received the Robert G. Boutlier New Investigator Award for her significant contribution to zoology and recognizing her as a rising star in the field from the Canadian Society of Zoologists. The Robert G. Boutlier New Investigator Award encourages and honours members of the Canadian Society of Zoologists within seven years of receiving their first academic or professional appointment. The award was presented at the 57th Annual Meeting of the Canadian Society of Zoologists hosted at Memorial University in St. John's Newfoundland May 10. DeWitte-Orr presented her paper, “Modulating Innate Antiviral Immunity at the Cellular Level Using Double-stranded RNA in Rainbow Trout," at the conference. DeWitte-Orr’s research specializes in examining long double-stranded Ribonucleic acid (RNA) to understand how to protect cells from virus infection. Her focus is to develop antiviral therapies for animals, including fish and frogs. Read more about DeWitte-Orr’s research. In 2016, DeWitte-Orr was recognized with a prestigious Early Researcher Award from Ontario’s Ministry of Research and Innovation, which helps promising researchers build their teams. 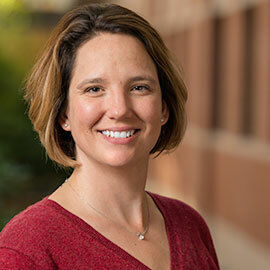 In 2018, Laurier awarded DeWitte-Orr the Early Career Researcher Award for her significant contribution to research activities and training students. Other Laurier faculty members who presented at the society’s annual meeting included Jonathan Wilson and Mike Wilkie, co-directors of Laurier Institute for Water Science (LIWS), and Alison McDonald, who acted as chair of the Comparative Physiology and Biochemistry section, along with Laurier students Ebtesam Barnawi, Scott Hepditch, Ben Hlina, Adrian Ionescu, Alexandra Muhametsafina, Julia Sunga, Laura Tessier, Carly Tward and Nathan Vo. The LIWS, of which DeWitte-Orr is a member, is a multidisciplinary collaboration between Laurier researchers examining the hydrological, ecological and biogeochemical sciences as well as the public policy and management of water resources. The LIWS supported the travel of students Sunga and Ionescu to the conference through a student travel grant program.